If I’m not taking care of kids, crafting, or blogging, you will probably find me researching family history. I’m a bit obsessed. I saw these family trees from Brightside Prints a couple years ago and decided to make my own as Christmas gifts (I am not affiliated with that company in any way.) I used a completely free program called Inkscape that you can download here. It’s great because similar programs can cost up to $300… no thank you! 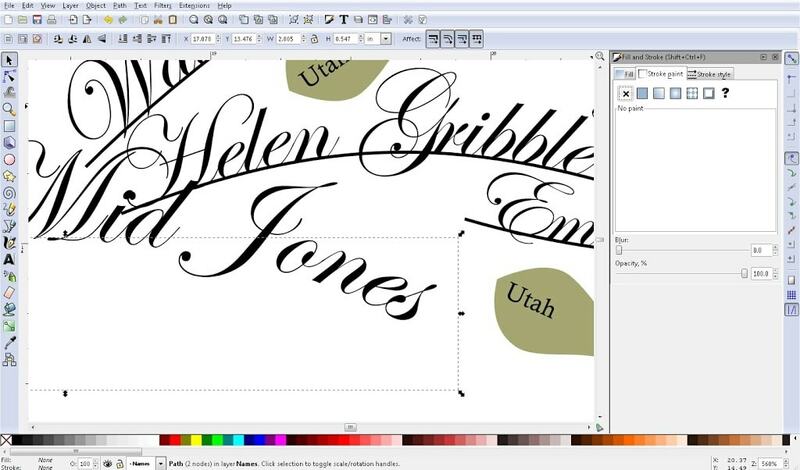 I now use Inkscape to make all of my patterns, drawings, and even Silhouette cut files. Here is my tree! I love it so much! I blurred out a bunch of the names to protect the privacy of some family members, but you get the idea. The bottom is made up of my kid’s first and middle names, the trunk is me and my husband, and the branches are all of our parents, grandparents, etc. I used middle names up through my grandparents and just first and last after that. Each leaf shows the state or country where each person is born. I’m going to do my best to show you step by step how to make your own. It’s pretty technical, so I suggest only trying this if you are pretty handy with the computer. Download the file that I made for my own tree here. (edit: Google Docs can’t generate a preview of an svg, but I believe you can still save/download it. Try clicking the arrow on the upper left that says “download the current version” when you hover over it. If that doesn’t work, send me an email, and I will send you the file.) Trust me, it will save you tons of time. I changed a bunch of the names, so the sizing is a bit off, but the names of your family will be different anyway so it doesn’t matter much. The font I used is Edwardian Script. I think it’s a standard font that comes with MS Office, so hopefully you have it! The file DOES NOT contain the background image, so you will have to get your own. Make sure it is high resolution, at least 300 dpi. Remember while you do this to SAVE SAVE SAVE multiple copies at different steps along the way so you can go back if you mess up. Notice the “layers” on the bottom. You can switch between those, lock/unlock a layer, etc. Use the + and – on your keyboard to zoom in and out. Click the text button on the left and double click on some text in the tree to change the names. For this bottom part, you are going to want to make sure everything is nice and evenly spaced between each name. The lines you see are called “paths”. To make them curve a different way or lengthen/shorten them, click the “edit paths” button on the left and click on the line. This gets a little tricky sometimes to click the path instead of the name. If you end up moving the name on accident, you will want to push “undo” at the top of the page to put the text back on the path. You should then be able to click the small square (or node) to move things around to where you want them. When you bend the text like this, things get a little messed up. 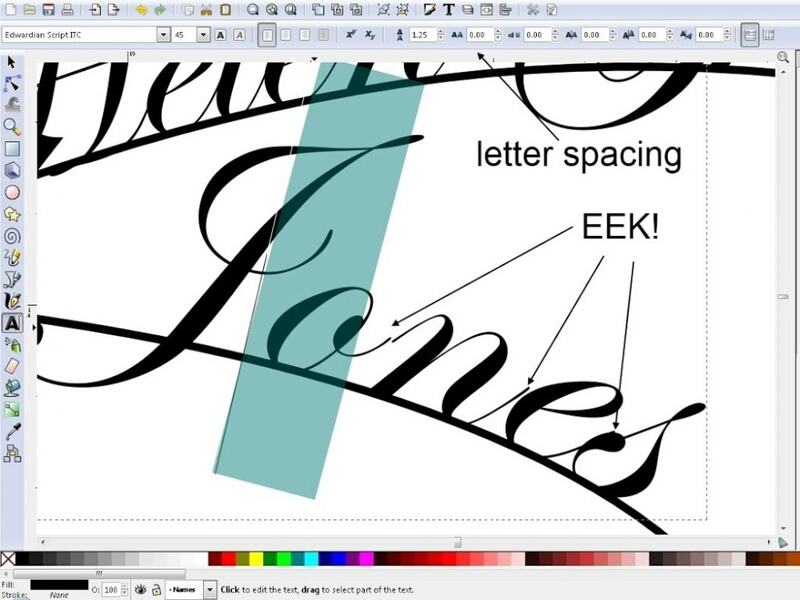 Highlight the letter before the spot you want to fix and make the letter spacing bigger or smaller. Do this for every name. Now is also a good time to spell check! Yes, this will take a long time! Ahhh! Much better! Put all of your leaves where you want them. When you are COMPLETELY done moving all of the text and leaves around, you want to make your path lines disappear. Double click the word “stroke” on the bottom left and a window will pop up on your right. Click the X to change to no paint. Do this for each line. See, the line is gone. 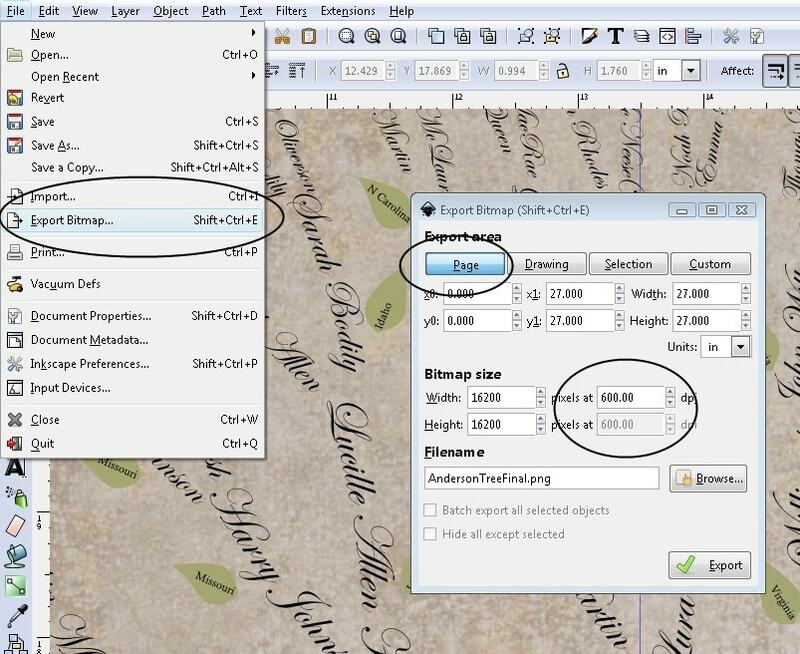 After everything is done, add your background image to a new layer. Check and double check all of your spacing, spelling, etc. Now it’s time to save. You want it to be high quality with those small fonts. To be on the safe side, I exported as a 600 dpi .png image. Now you can send the file off somewhere to get printed as a 24″ x 24″ piece of art. I’ve found that a lot of places do not take file sizes this large, so you may need to search around a bit to find the printer that is right for you. (Maybe if you save it as a smaller dpi, you will have better luck, but I don’t know what that will do to the quality. **edit: a friend told me they had success had 300 dpi**) I REALLY wanted mine printed on canvas. It was a bit pricey, but worth it for a nice quality piece of art for a family history nerd like me. I found CanvasPop when I printed these as gifts, and used the company again to print my own. They have a satisfaction guarantee, and they take great care in creating a quality canvas. Since I was going to be telling you about them anyway, I decided to become an affiliate, so if you click a link or button and buy, I get a commission. **edit: I am no longer an affilate** As always, I am giving you my honest opinion. You will notice that you cannot upload a file this large directly to their site. All you have to do is call or email them, and they will give you instructions to send your file to their dropbox. I love that you get to deal with REAL people! Let me know if you find a better or cheaper way to get it printed. I’d really like to know. **edit: A reader told me that he got his printed at Walmart for a much lower price! ** So glad to have this space on my wall filled with something that I love to look at! Anyone else into family history? Wow, that is seriously cool. What an awesome and unique piece. Wow, that is a beautiful family tree! 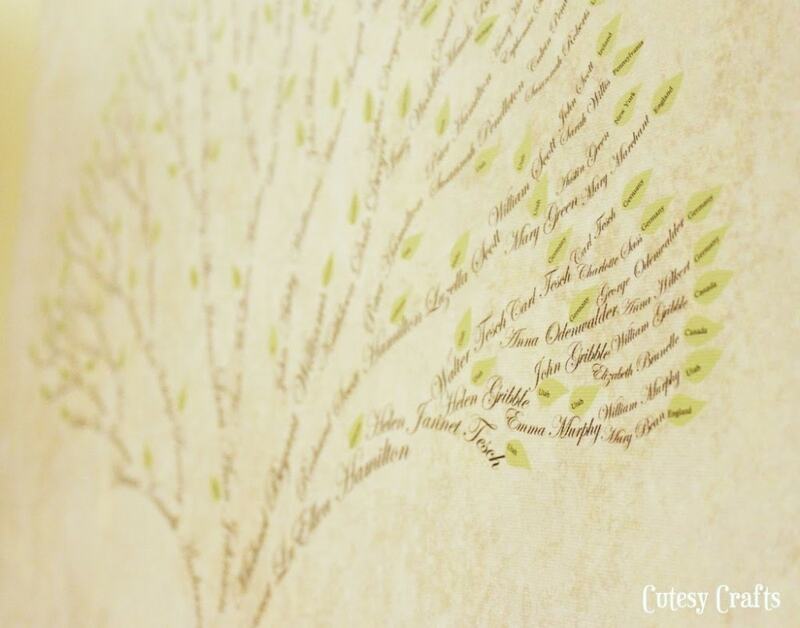 I would love to do something like that, although I have a feeling that my family tree would be quite lopsided…a few years ago my Granny on my dad’s side did some major genealogical research into both her and my grandpa’s side of the family, but my mom’s side is a bit of a mystery. I don’t know if my last comment went through, but how much would you charge to do half a tree for someone like, oh, me? You already have one side completely finished. 🙂 Your tree is beautiful, by-the-way. What a great project! 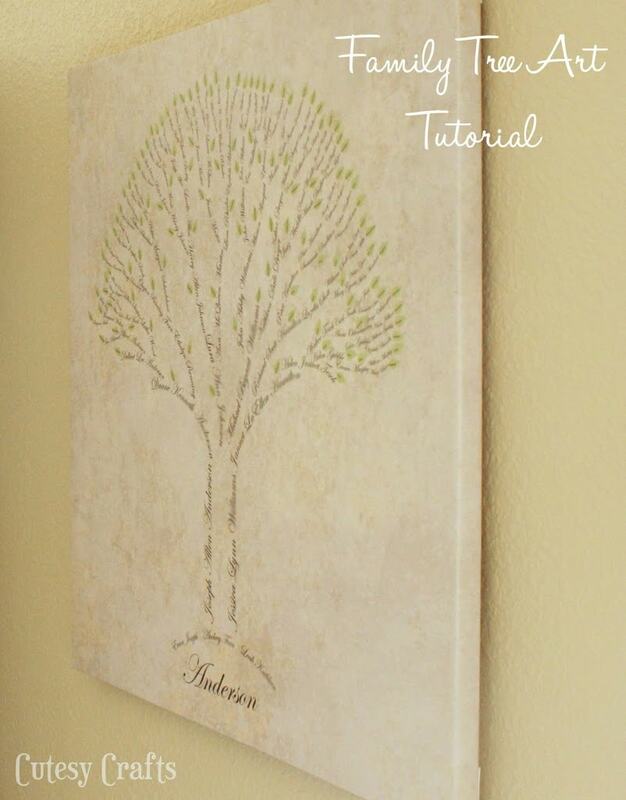 This would be a great way to display the family tree that my husbands grandmother put together. Thank you for sharing on Fluster’s Creative Muster Party! 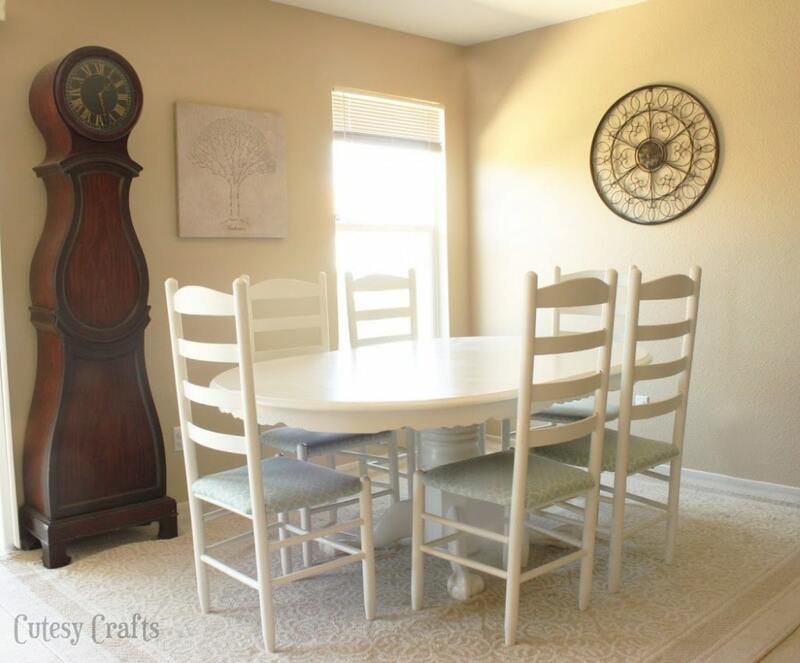 Thank you for sharing your project on A Crafty Soiree! I’ll be featuring you this week and I hope you’ll be by to see it and link up more of your fabulous ideas! I just love your family tree, what a fabulous and one of a kind decoration full of meaning for your home. Thank you for putting in the time to create a tutorial! Thanks Katie! I will be by to check it out for sure! Thanks for linking to Take-a-Look Tuesday over at Sugar Bee Crafts – you were featured yesterday!! Wow. Your tree is so lovely and impressive. Thank you for the great tutorial. I’m thinking these would make wonderful Christmas gifts for my parents and my hubby’s parents. I LOVE this and want to make one. Would it be possible for you to email me the File? I have tried several times and multiple days to download it but Google Docs says “Sorry, we are unable to generate a view of the document at this time. Please try again later” Does google docs open SVG files? Ummmm, I want one! This is the best family tree I’ve EVER seen! Pinned and waiting to make one of my own. *two thumbs up*! That’s great Tina! I would love to know how it turns out! Good luck! I love to do genealogy research too, and I have to say that I think this is one of the best family trees that I’ve ever seen! I even have Inkscape already on my computer. I’m going to add this to the mighty To Do list. I wonder if you could fit birth/death years, as well as the state/country on the leaves? I have my husband’s side of the tree research all the way back to the 1600s, but I don’t have all of mine that far back (parts but not all). I’ll have to play around with it. Maybe do more research, I suppose! Thanks Tina! 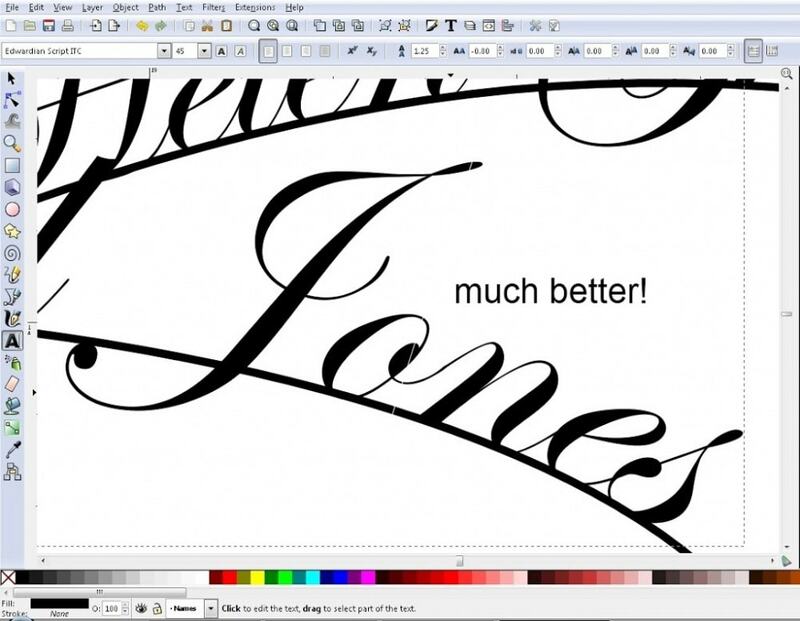 That’s perfect that you already have Inkscape! Yeah, I think you might be able to fit the year. That would be cool. I think my printed tree only goes about to about 1700s, so you might not have to go back very far to get a complete one. This is wonderful! I don’t have internet, so no way to download inkscape. But when my hubby and I do get it, I definitely want to do this! We don’t have any kids yet either, but I’m sure I could save the file and add them later. right? Oh my heavens. I think I have lost my mind but I’m going to give this a shot. Yikes! Thanks so much for sharing your hard work!!! This is so amazing! Thank you for sharing your work for FREE! This made my day and I’m loving how our family tree is turning out. You should be able to just copy and paste one of the other names. If that does not work, you can create a new “path” to type on. 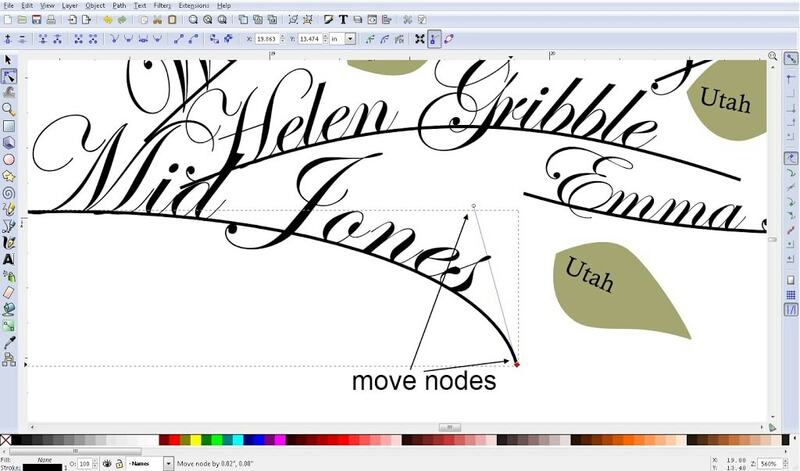 Do this by using the bezier curve tool. Type some text and select both the text and the path by holding down the “shift” key. With both selected, go to the “Text” menu on the top and select “Put on Path”. Hope that helps! This is so beautiful! I just started the process and am grateful for you to take the time to explain all of this! Thank you! Also, I am not quite there yet, but I am confused on the background image. Where did you get a background image? Thanks again! You might be able to find a free scrapbook paper or similar image online somewhere. Just make sure it is high enough quality that it won’t be pixelated when you go to print. The one I used was purchased, so it is not mine to share. I think that one came from thinkstock.com. Hope that helps! How many generations did you do on this one? I really love family tree artwork of any kind. I’ve just never made any of them. This one is awesome! AH-MAZING! I was just describing this idea to my husband to make for our grandparents for Christmas and found your blog. Thank you so much for the link to inkscape as well – you are a life saver 🙂 I am so glad I found your blog! Glad you found it too! Hope your grandparents love it! I can’t seem to upload my tree to walmart.com or other photo places. I think its because its saved as a pgn. can I save it as something else to make it work? Maybe you can open up the png in another photo editing program and save it as a jpeg from there? You might have to take the file into the actual store to get printed. Not sure since I did mine through canvaspop. Let me know what you figure out. Thank you so much for posting this tutorial, Jessica! 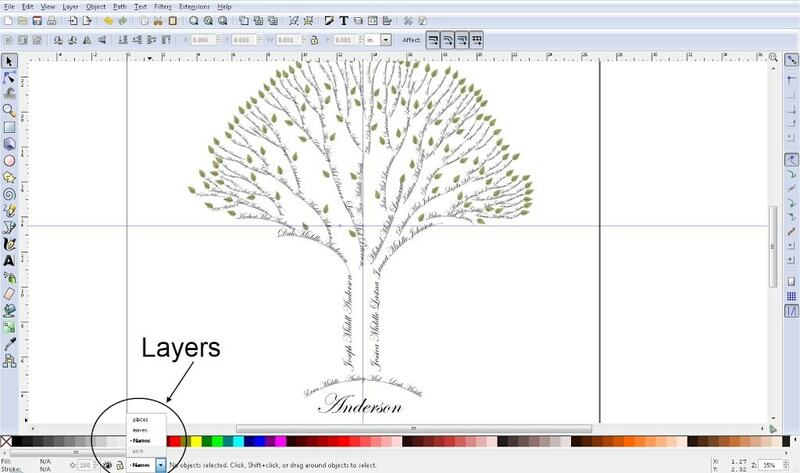 Your instructions and template enabled me to produce my family tree in just a few hours. I’m going to feature your tutorial in my WeGoBack December newsletter (with a hyperlink to here, of course!). This is beautiful!!! Way to go, you knocked the project out of the park!!! Thanks Deanna! It’s one of my favorite things! Jessica, could you please send me an email at wgb.familyresearch@gmail.com … I’ve got a question to ask you about use of your template. Thanks! Hey Thank you so much for sharing this with us! I am all finished with mine except for a background. However I can’t figure out how to add the background. Any help would be greatly appreciated! Thank you so much again! Yay! I figured it out…it was a lot easier than I wanted it to be. I am so excited…now I just need to print! Thank you so much! Haha. Glad you figured it out! Hi Jessica- I absolutely LOVE this design- its so classy yet fun. I really wanted to make a family tree for my Grandparents for Christmas this year. I have been trying to draw my own out by hand and the spacing has been a nightmare! I tried downloading the file and couldn’t get it to open, would you mind e-mailing me the file? My email is Leighto192@gmail.com. Thanks so much! Jessica, I must say that this absolutely awesome. I am going to try my own. I am good with Inkscape so I hope mine turns out as great as yours!! If you already know Inkscape, then yours will turn out great! Good luck! Hey there! I tried opening the link to make one for myself, but Google Docs is stating that it is no longer available. Is this something that you could email me as your tutorial states? 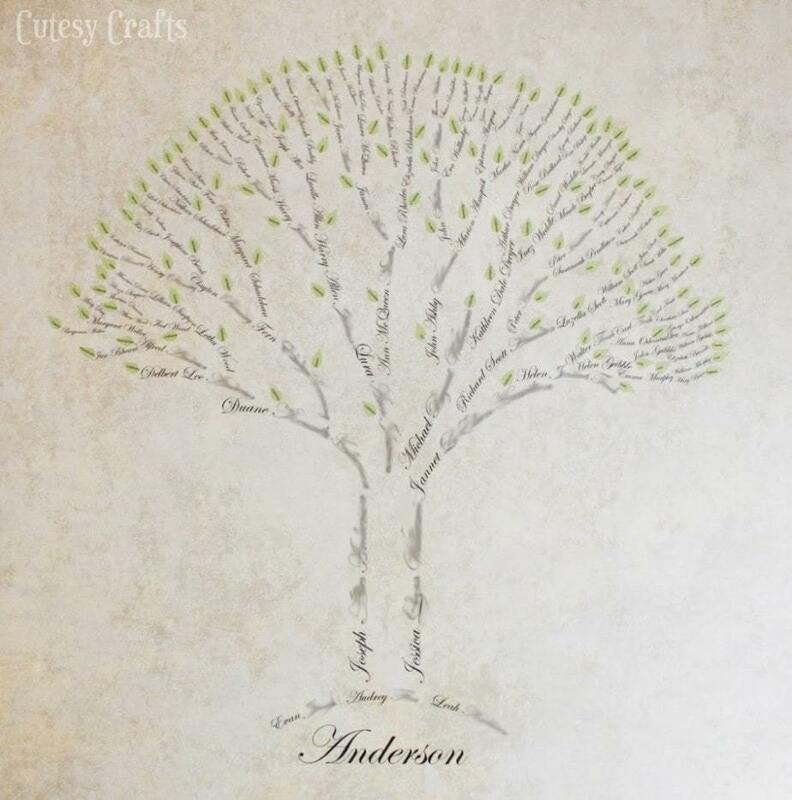 This is such a gorgeous family tree that would great as a gift! You are truly talented! Thanks! Yep, for some reason that one doesn’t like to open up for people. Send me an email at cutesycrafts at hotmail dot com and I will send it to you. Thank you so much for this! I didn’t even know about Inkscape, so your entire tutorial has been a wonderful revelation for me. Seriously, you have made my day. Maybe even my month! That is so beautiful. I need to try to see if I can do one for my family. Only issue is I got three baby daddy’s and my husband has two baby mama’s. So there maybe a few small saplings laying growing at the side of the trees. I have to represent their families too. Not sure how that would look but I love the way your tree looks. Hahaha. Thanks! Your comment made me literally LOL! Maybe you could do one without the kids… or, like you said, have some little trees nearby? Or maybe roots? I love this. I am currently trying to create my own using your download. But I can not work out how to move the leaves. I have had to move mine around a bit cause there is a few gaps in mine. Thank you very much for sharing your tree I was going to try this myself but had no idea now to do it. You have to switch to the layer that has the leaves on it (at the bottom). That should work. If you still can’t move them, check to see if the layer is locked. I love this and have been trying to figure out how to do in embroidery. I am not real computer savvy. I am disabled and cant purchase much. Is there anyway you could email me this? I tried clicking on your link, but nothing happened. I want to make some for my children and grand children. I am hooked on genealogy and have been for over 30 years, and I think it would be something all my descendants would treasure. I forgot to leave my email sorry. Wow, what a treasure! Thank you for sharing. Found your tutorial on Pinterest — thanks so much for the info about Inkscape and template! I used yours as inspiration and made just a 6-generation, landscape, 8.5 X 11 version I could print from my own computer and frame. (More economical if I ever get past some of mybrick walls and need to reprint.) I’d love to show it to you if you can shoot me an email so I have your address. Thanks for sharing your knowledge!! This is so amazing. I found your tutorial a year ago and have been trying to be brave enough to tackle the project. I finally did it this month and just got my canvas in the mail. It is so beautiful and I’ve never been so excited to hang something up in my house. Thank you for being inspired to do it yourself and for taking so much time to make an awesome tutorial. It took a long time to make the tree myself – I can only imagine how long it would have taken from scratch. Thanks again! This will be something we treasure forever! 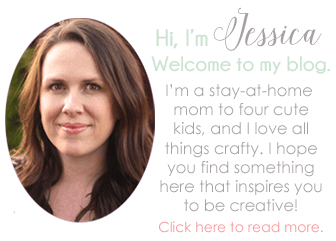 Hi Jessica, Thank You so much for sharing with us! I found this page with your beautiful tree and I fell in love with it. I too like Rebecca found myself wanting to try it out and now I am here ready to start. I have quite a large Native American family and my husband also requested for me to also do one for his family as a gift to his 84 year old grandmother. I just wanted to express my gratitude and I appreciate your generosity. Thank you, Thank You! I will keep you posted if you’d like to see the finished projects! I think they will make wonderful gifts! P.S. I usually work in photoshop but I find inkscape to be decent and I don’t mind learning a new software. Shame on me for taking so long to thank you and get my own project started! I am trying to download the tutorial but it won’t let me. Is there anyway you would be able to email me? I love this so much and really appreciate you being willing to share your talents. Trying to figure out how to add a background so my tree doesn’t print out on a crisp white background! Can you tell me how you created your background? I tried searching the net but couldn’t find a clear answer anywhere. Thanks for sharing your tree with us. It’s awesome! You need to find a digital scrapbook paper or something similar to add. It needs to be high resolution so it will print nicely. You will add that in another layer behind the rest of the layers. Could you please send me the file? The file above isn’t working. I would like to know who goes on the tree and where. I see your children, then the truck, their parents but don’t understand the middle line in the tree. Would you help me with this, please. I love this! Yes, the children are at the bottom, then the father on the left and mother on the right. The rest of the tree follows that pattern, with two names coming out of each name. So the left tree trunk is my husband, the branch coming out of the left of his name is his father and the one coming out of the right of his name is his mother. My name is the right part of the trunk, my dad’s name comes out of the left side of my name, and my mother’s out of the right. The pattern continues, and the names get a little smaller with each generation. Hope that makes sense. Hi! I was so happy to see your tutorial for the family tree. Wondering if you could send me the file. I wasn’t able to download it. Thank you so much! Just sent it. Let me know if you don’t get it. Love your family tree!! I too am not able to download it, so if you could please send me the file I would be very appreciative. Thank you very much! Hi,I’m working on this now, thanks for the great tutorial. I do have a question on how to move the leaves, I read through the comments before since I didn’t want to ask you a question you’d already had to answer a million times and only saw it mentioned once. Your answer was to unlock the correct level. I only have 1 level and cannot unlock a different level as there isn’t one. Is there a different way? Thanks!! Oh good! Glad you got it figured out. Good luck making your tree! Hi, can you email the family tree file you used in Inkscape for the canvas you put on your wall. I got the program Inkscape to download on my computer, but I can get your file. Yep, just sent it to you. Let me know if you don’t get it. Thanks for the great tutorial. It helped me understand a lot. I have never used a vector program before. 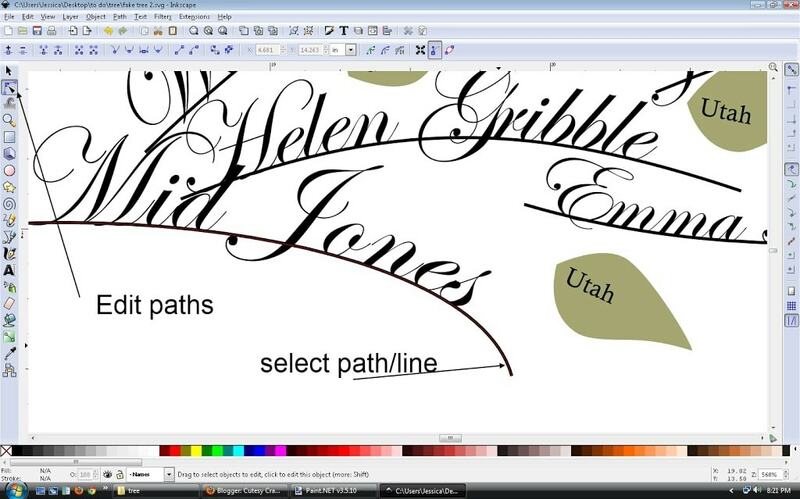 Although I can change the curved lines of the path (lines) I can’t see how to change the curve of the text when mine needs to be a little different. Also sometimes when I change your names to mine I lose a letter or more at the end (presumably because my name is longer) I can’t see how to extend the text box to allow more letters. Can you give me any input on those problems? Thanks, I love this! The text and the line should be in sync with each other. You want to move the line, and the text will move with it. If your name is longer, you will need to make the line longer by dragging the dot (node) at the end of the line. Sorry, I know it’s hard to explain through typing. My text and line don’t move together. When I select, it either selects one or the other. Weird. Weird. Maybe they updated the program and changed something. You might have to select each name and add it to the line. I can’t remember where the setting is, but you would select both the line and the name and choose “add text to path” or something like that. Great tutorial! I have some issues with my family tree. I went back to 1790 with one branch and to 1850 with the other. Wouldn’t it look strange if one part of the tree is larger than the other? My other issue is that my two grandparent’s greatgranparents were siblings and I don’t know how to show this on the tree. My tree also went further back in some places than others. I think I stopped at my 3rd great grandparents. If you have some gaps, you gotta kinda move the branches and stuff to fill them in. For the siblings, I would probably just add the parent’s names twice. It would probably look funny to have the branches go back together even thought that would be correct. Totally up to you though! This looks like an awesome project. Can’t wait to try it. I was able to download it, but when I open it, it opens under internet explorer the capabilities that show on your sample screen are not there, just the internet tools. Could you send me the file? What do I open it as? In? Did you download the Inkscape program? 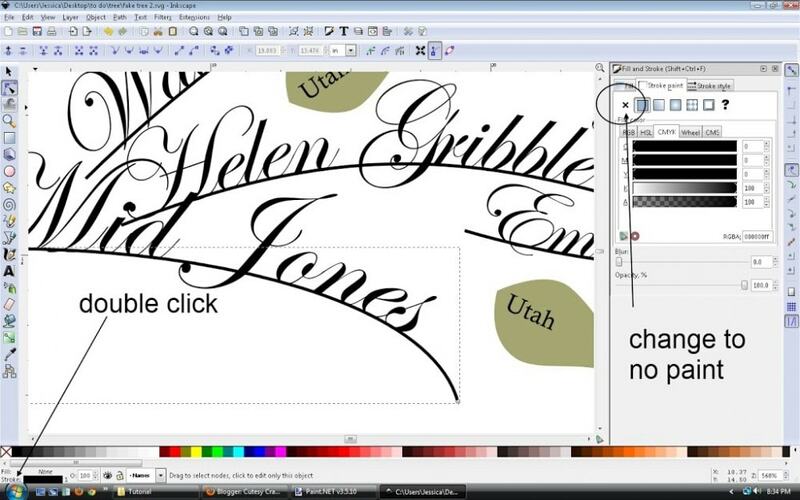 If you already did that, right click on the family tree file and choose “open with” and choose Inkscape. Let me know if you have trouble with that. Jessica, I didn’t have a problem downloading Inkscape or your template. However, I read a bit earlier in the comments that maybe a newer version of Inkscape isn’t allowing your template to open with layers? It tells me there is only one layer with over 242 parts to it. I cannot click on any individual items to adjust or change them. I know this was created a while ago by you, but I’m still gonna ask: do you (or anyone else reading this) have any suggestions? Hmmmm… I just opened it with a version that I downloaded last year. It did give me lots of options when I opened the file. Does changing any of those make a difference? Je fais ma genéalogie et j’aimerai essayer de faire votre tutoriel !!!!! Pouvez-vous s’il vous plaît m’envoyer le fichier? Merci beaucoup! Just sent the file to you. Hi Jessica – your file download is not working. Can you send that to me? There’s no arrow on the left side that pops up as included in your instructions. Thank you!! I was able to download the file after several attempts. The key was to “save” the file and not “open” from the web. Those little leaves are a bit difficult to move around. Any hints? Glad you were able to get it! I would move the leaves last. If I remember right, they are on a different layer. You should be able to hide that layer while you work on the other layers so they don’t get in your way. You can also zoom in (I think you press ctrl+ or maybe just +) to help. I love this project! Trying to attempt to create one now but I’m having difficulty working in a svg file. Can you please send me the document? Thank you so much for this!!! I read all the comments — which were very helpful! I was able to download Inkscape & the google doc. I’ve even been able to figure (for the most part) how to manipulate the names, paths and leaves. You’ve done an amazing job and I am forever grateful this! Thank you thank you thank you!!!!! This is so beautiful! 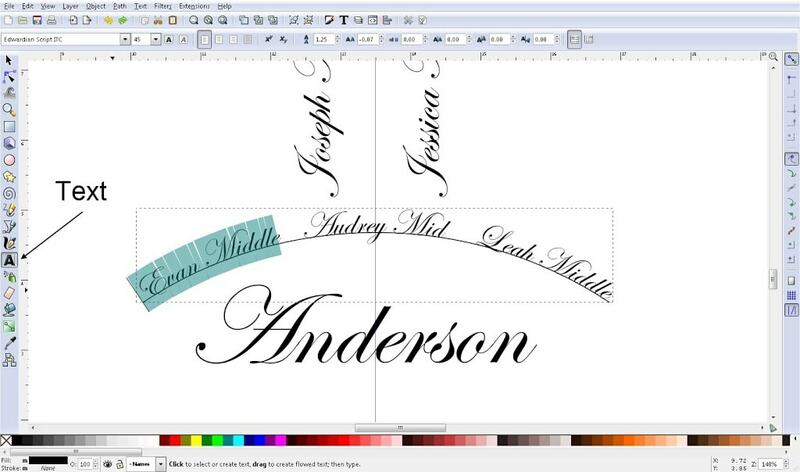 Would I be able to use Cricut pens to write this rather than have it printed? Thank you! I don’t know how the Cricut pens work, so I’m not sure. If they can handle really small text, then you might be able to. If you get it to work, please come back and let us know! I LOVE this and need to make one. Would you please send me the document? I need to make one for sure. Thank you! I’m a bit intimidated because I’m not very good at anything technical but I need to figure out how to make one! !